Enhanced by our SmartID technology, the smart USB port is capable of identifying a specific device, and thus ensuring maximum charging efficiency and speed. With SmartID, our charger “knows” your device and charges at the maximum speed. – 24W/4.8A dual USB output lets you charge any two smartphones or tablet devices simultaneously, at top speed. 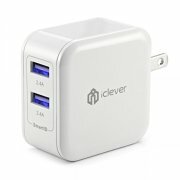 – This compact adapter has a foldable plug, fits in the palm of your hand and is perfect for travel. – This USB wall charger is not compatible with iPod nano, iPod Classic, HP TouchPad, Dell Venue 11 Pro and Asus tablets.